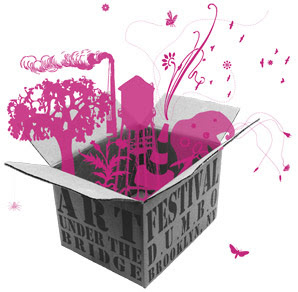 The Dumbo Art Under the Bridge Festival, which is one of our favorite Brooklyn arts events of the year, kicks off tonight and runs through Sunday. Brace for two full days and nights of outdoor events, performance art, special exhibitions, sculpture installations, open studios and more. Every year when we go, there are always a few surprises that manage to stay with us. At night, there's going to be a "Project Glow" with lighted installations in Empire Fulton Ferry Park and Brooklyn Bridge Park, along with free Water Taxi rides so you can see them from the water. A full schedule is available here, just click on "Download PDF." Of course, the Festival is just one part of a Brooklyn weekend that is full of events including the Atlantic Antic on Atlantic Avenue on Sunday, the Chile Peper Fest at the Brooklyn Botanic Garden on Sunday and the Coney Island Film Fest, which starts tonight and runs through Sunday. Brooklyn Based has produced a nice guide to some of this weekend's festivities.